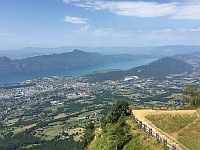 Mont Revard sits on the D913 between Aix-les-Bains and Chambery and is worth a visit for the spectacular views if offers from the plateau at the top alone. The run up from Aix-les-Bains is nice enough with the virtually traffic free road gently climbing up through dense forest, similar to the run up to Semnoz. Not far from the top there’s a turning signposted D913A Le Revard – be sure to take it because this will take you past the Le Revard ski resort and up to Le Plateau du Revard where there is a viewing area. From here you can see Chambery Airport on the left, at the southern end of the lake, and Aix-les-Bains on the right. But what dominates the view is Lac du Bourget, the deepest, and depending upon the season, the largest natural lake in France. The run down towards Chambery is nice enough too, no longer in the forest like the run up from Aix-les-Bains, although we turned off just after the ski resort of La Feclaz and headed to Le Chatelard instead.